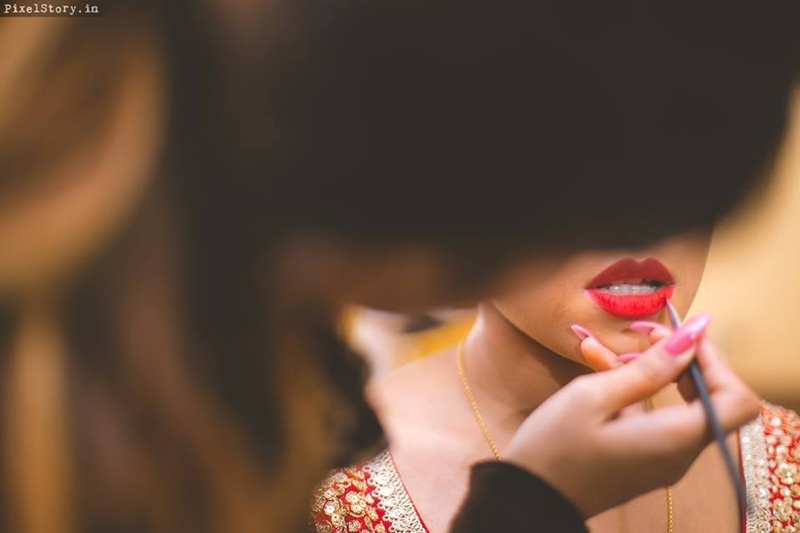 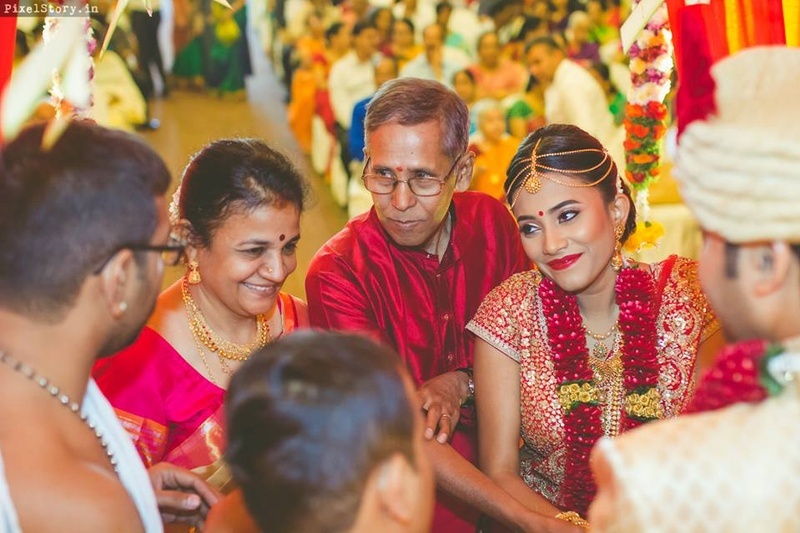 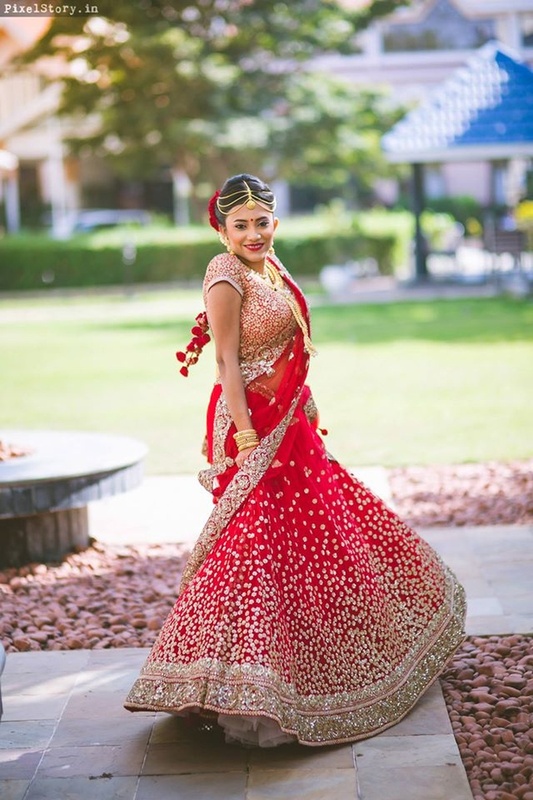 This love story dates back to Orkut times when this gorg bride was 15 and groom,17. 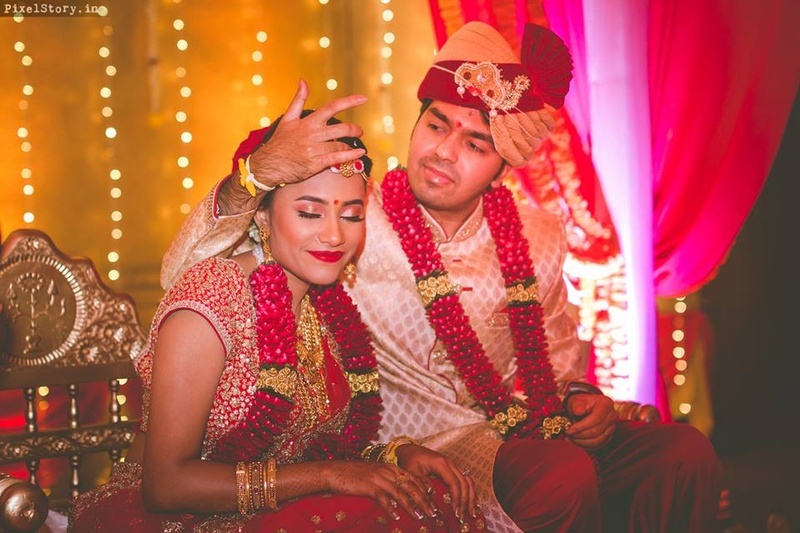 Through secret messages, lots of long chats and bucket-loads of love and mush Chandini and Akshay stand strong in their love today. 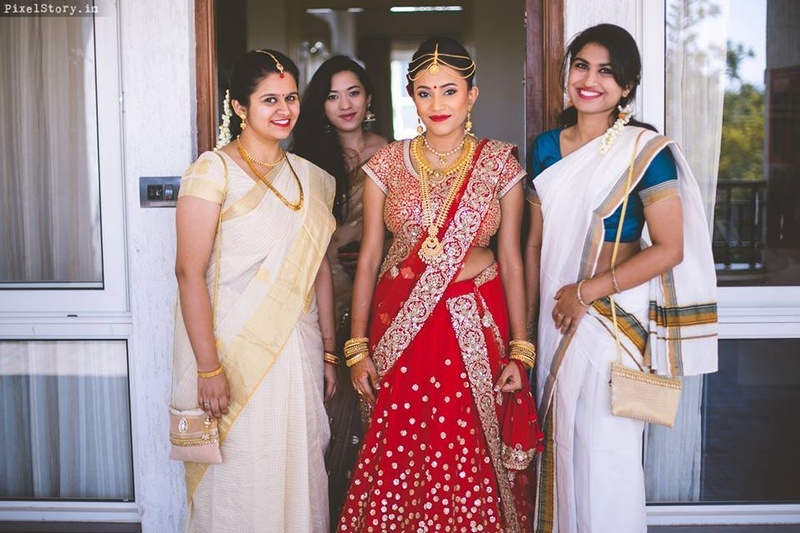 Now, aren't we thankful for Technology? 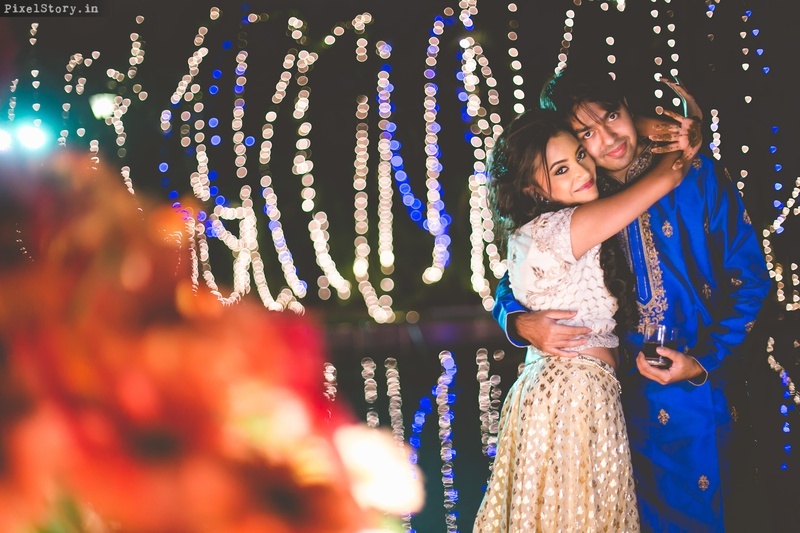 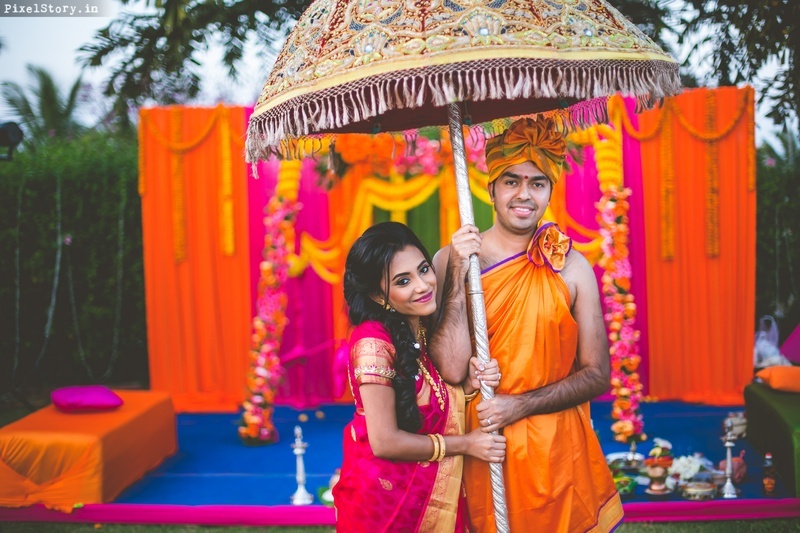 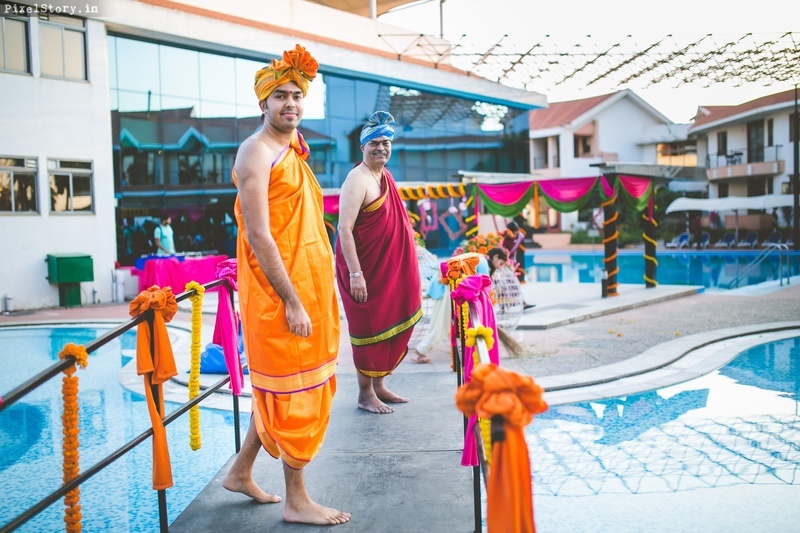 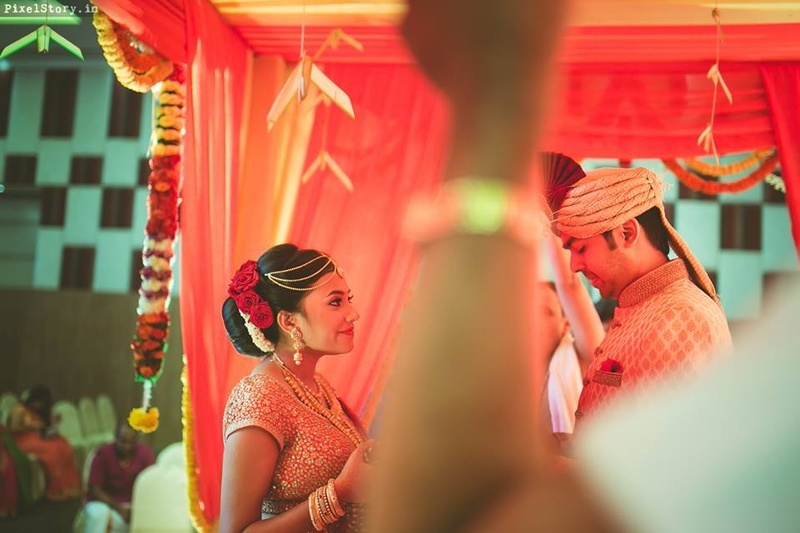 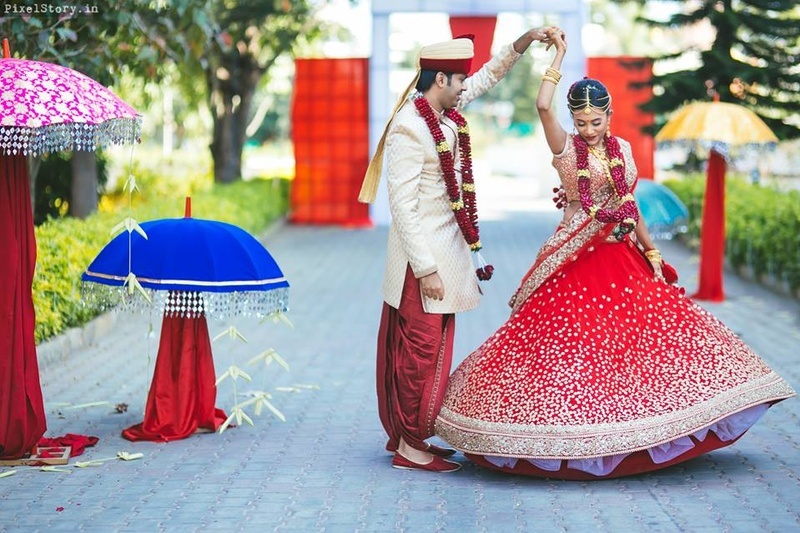 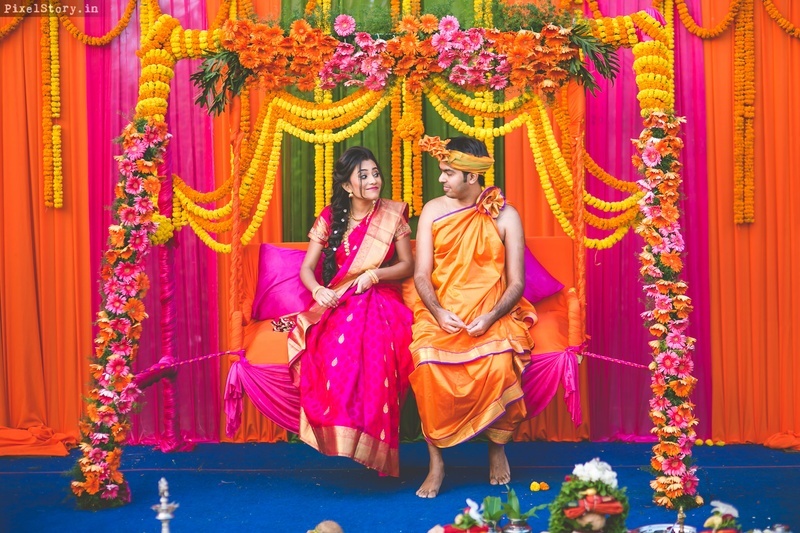 Two best friends made vows of togetherness for a lifetime in a wedding so traditional with bouts of fresh colour and vibrant details - Akshay and Chandini's wedding held at Clarks Exotica Resort and Spa, Bangalore had us completely swooned! 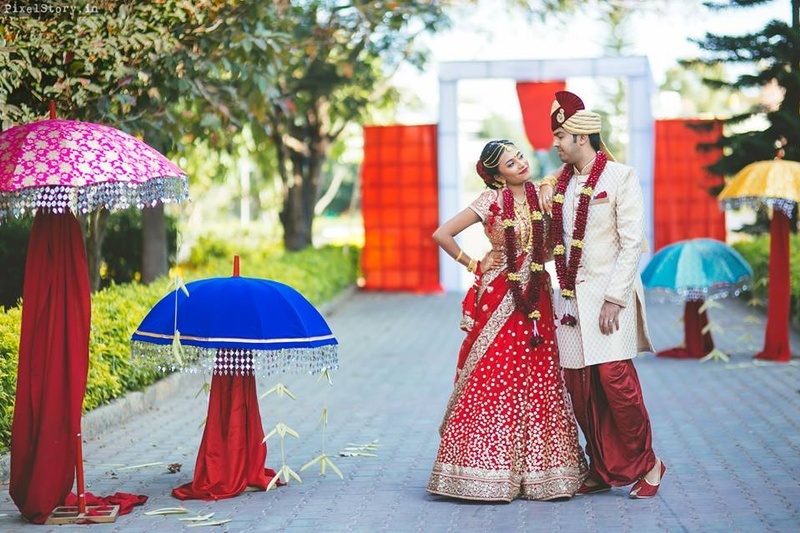 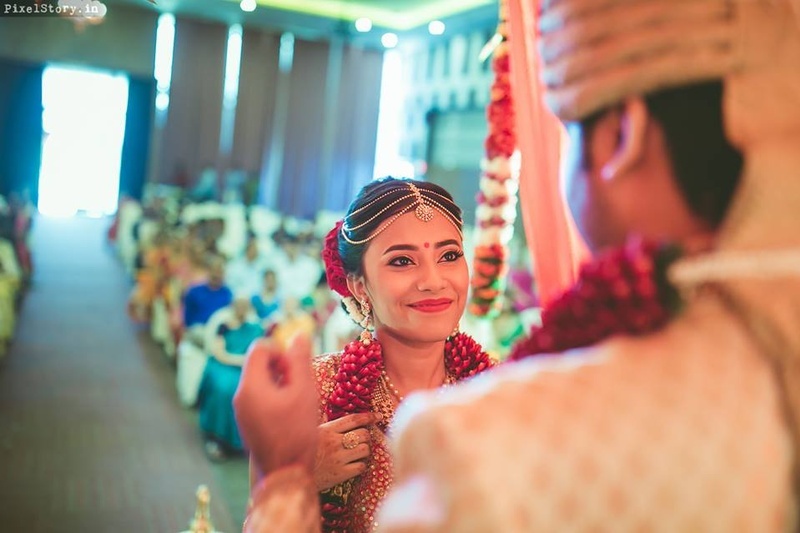 Shot brilliantly by PixelStory.in their wedding had all the inspiration of a fresh young cross-cultural wedding! 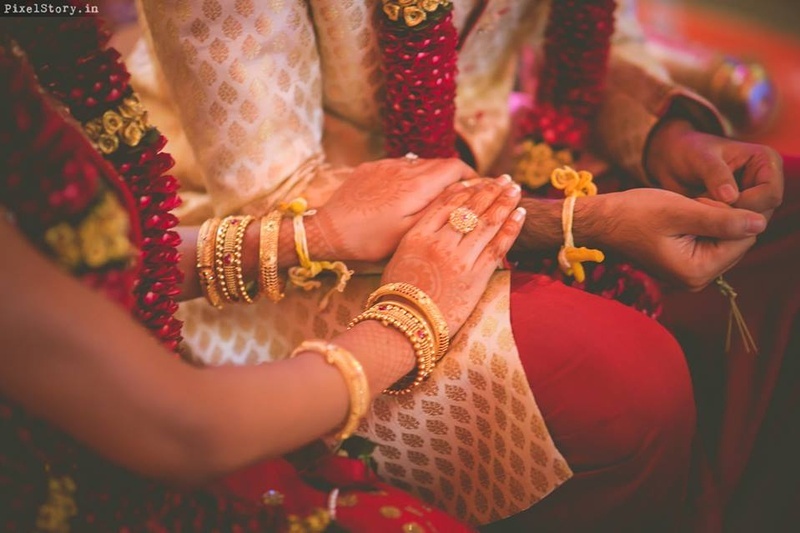 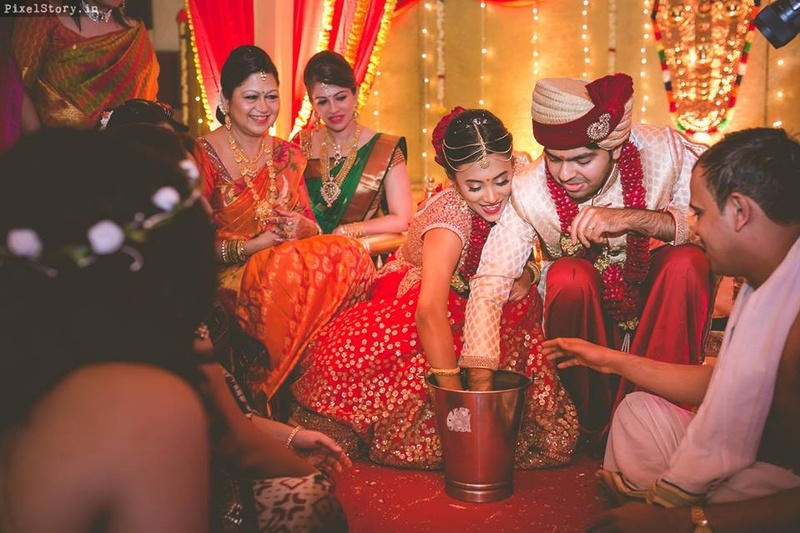 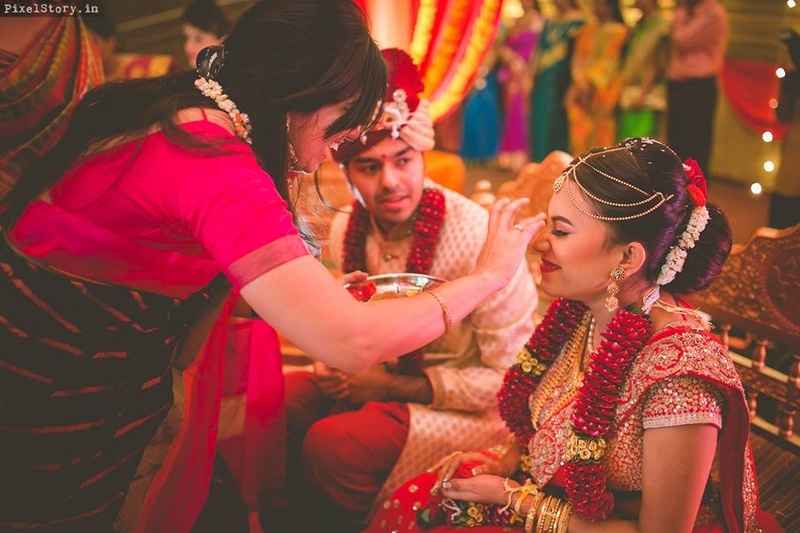 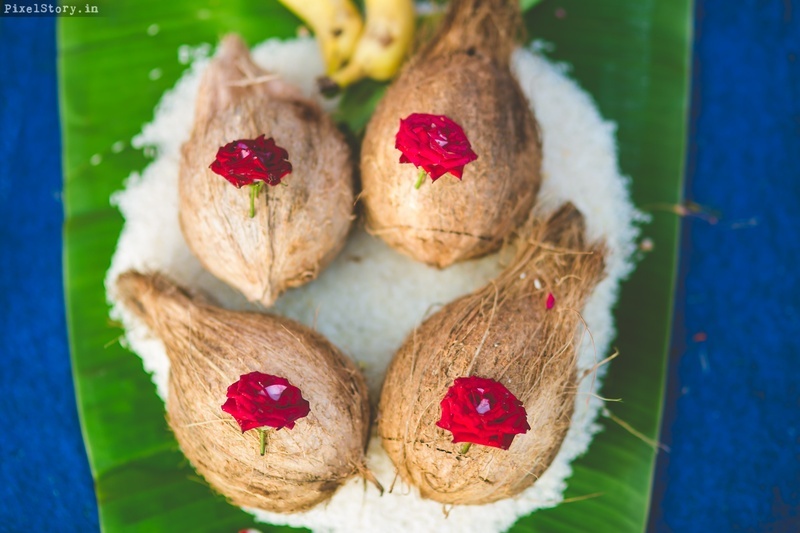 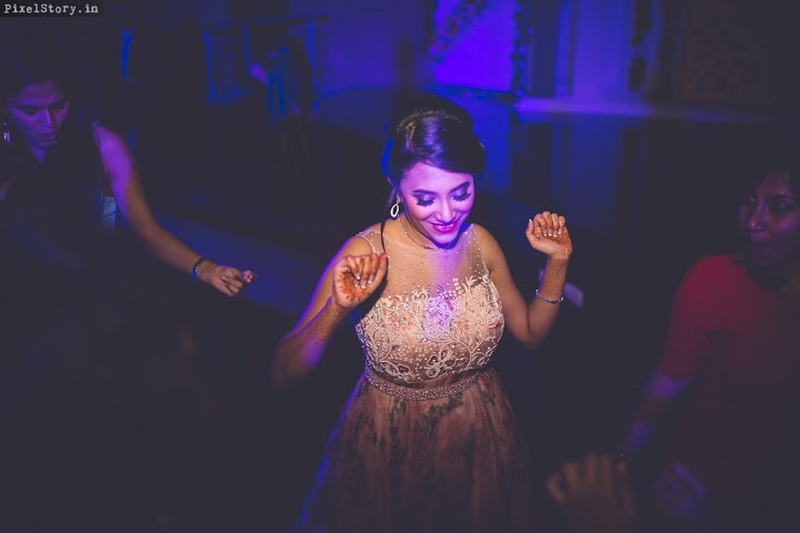 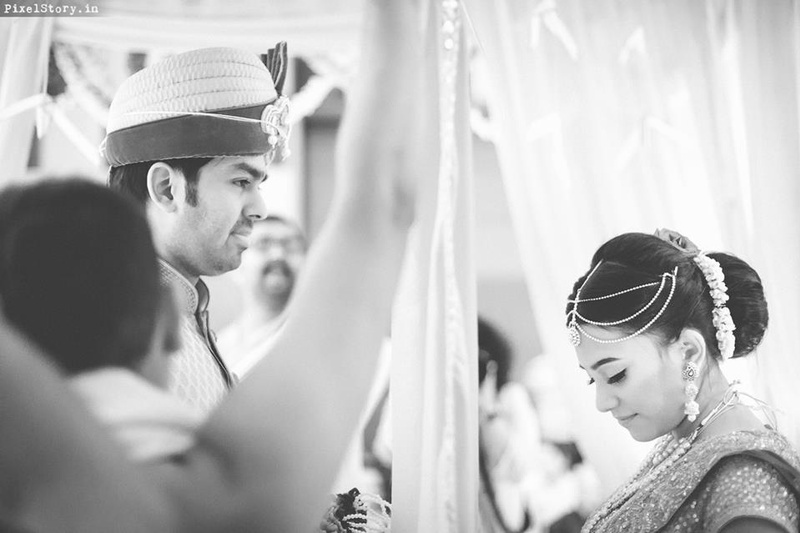 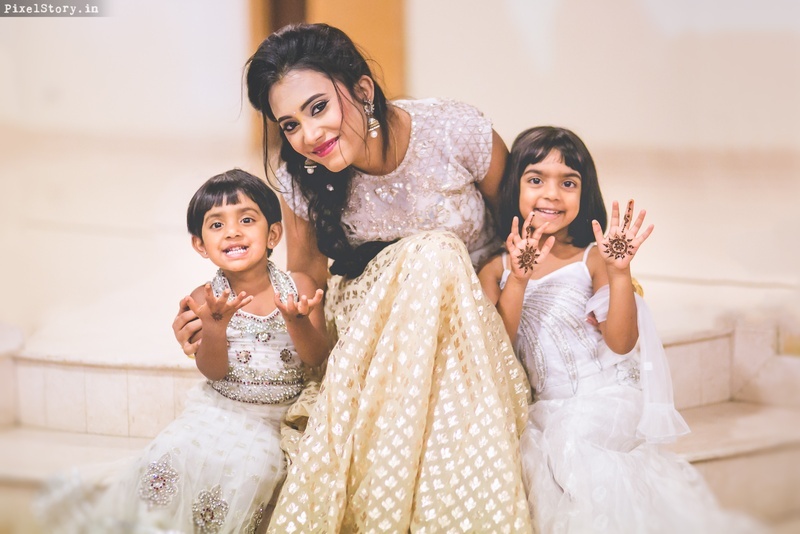 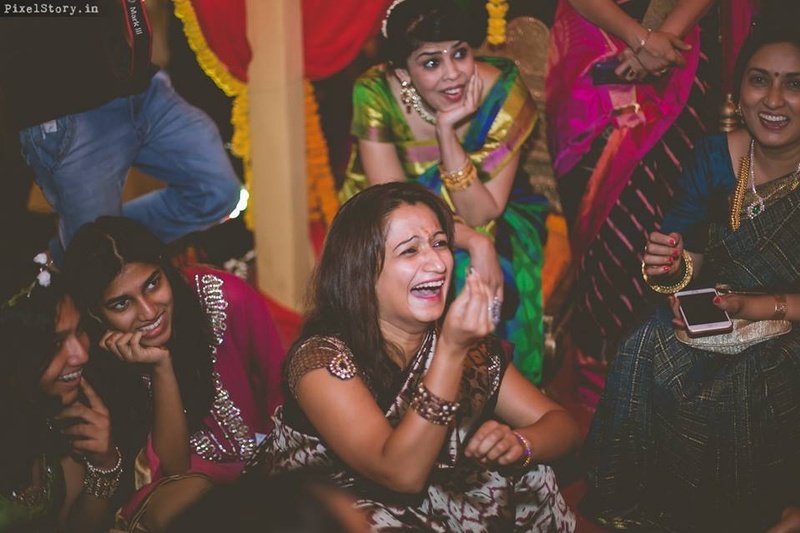 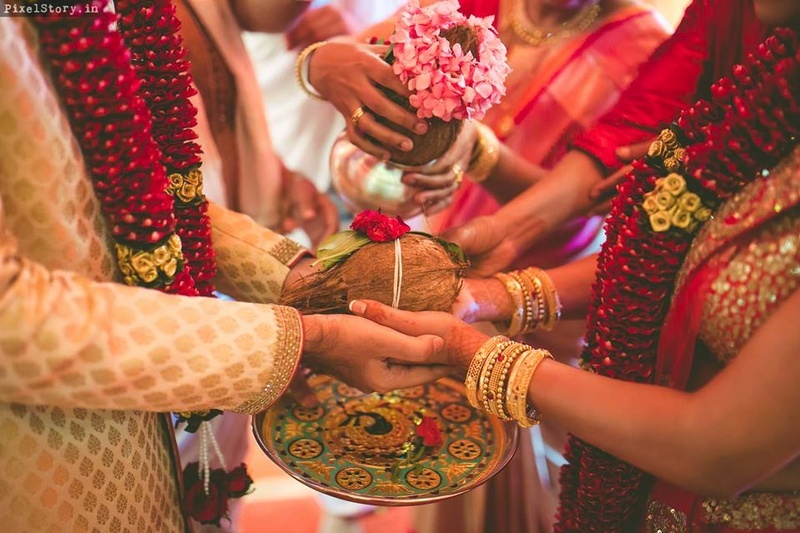 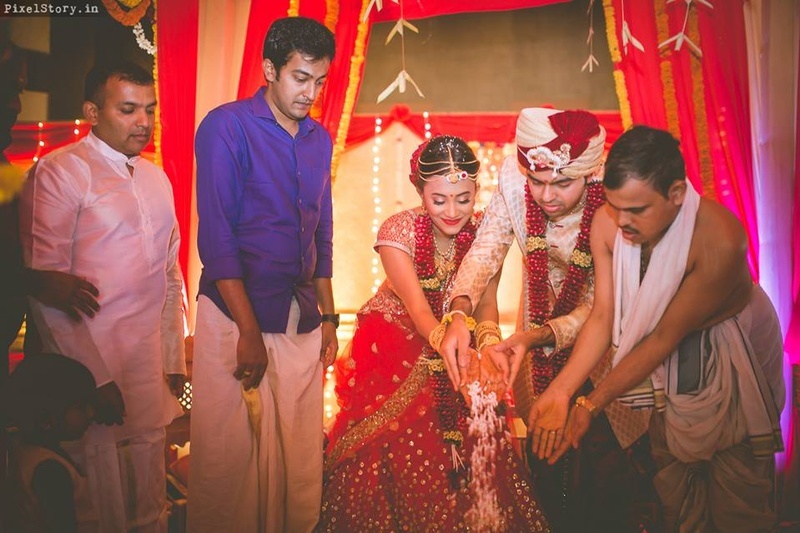 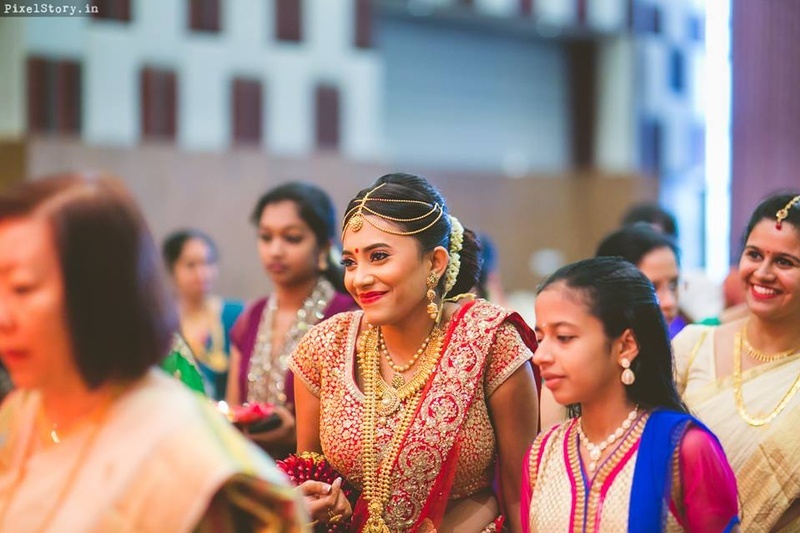 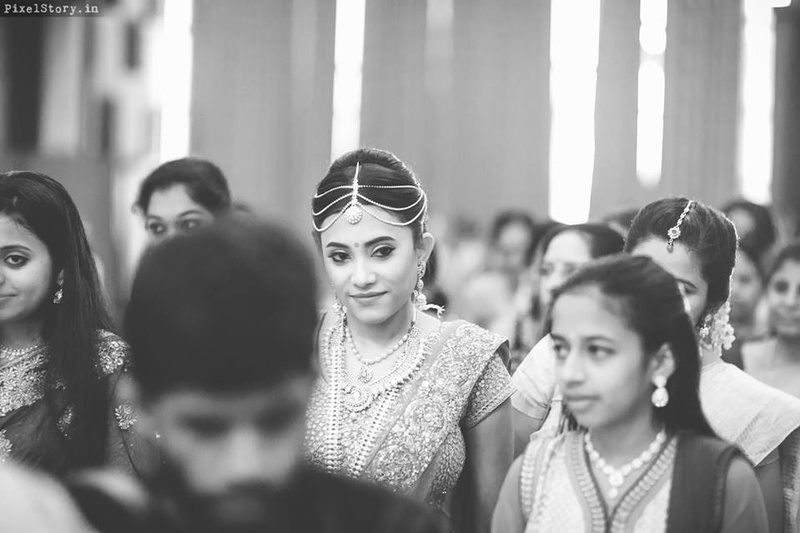 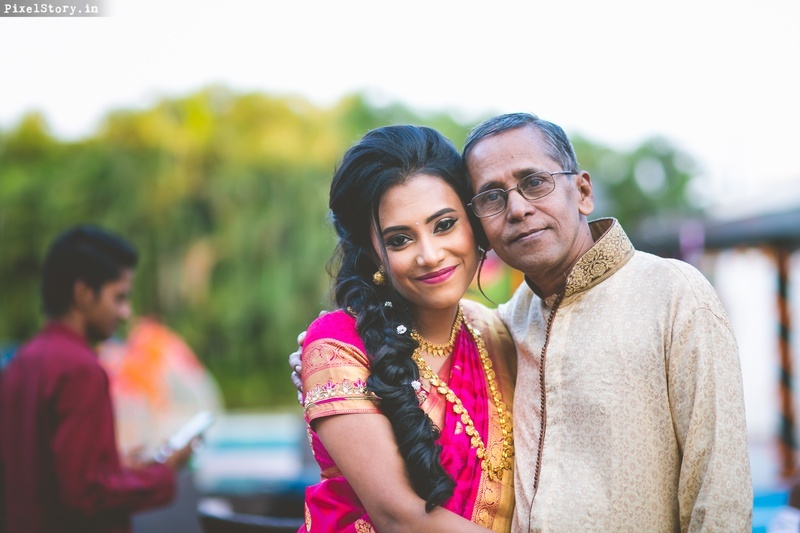 This cross-cultural Brahmin-Konkani and Malayali wedding began with Konkani wedding rituals while the wedding was done complete Malyali style. 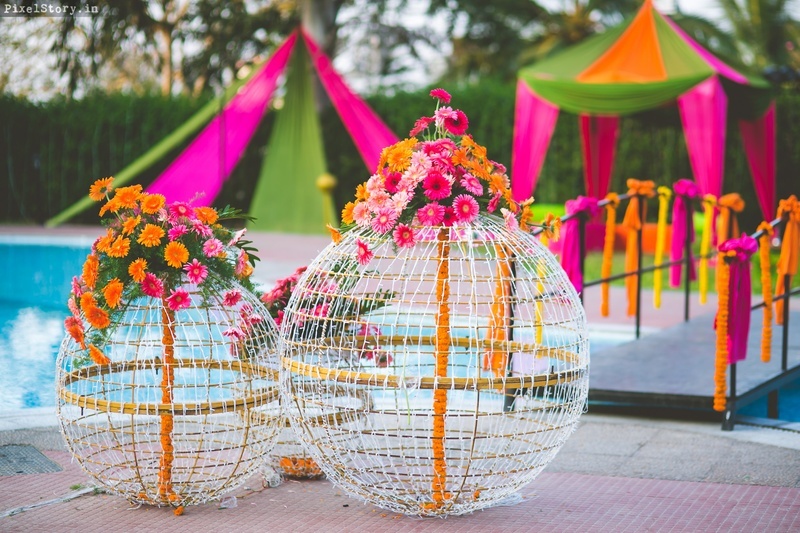 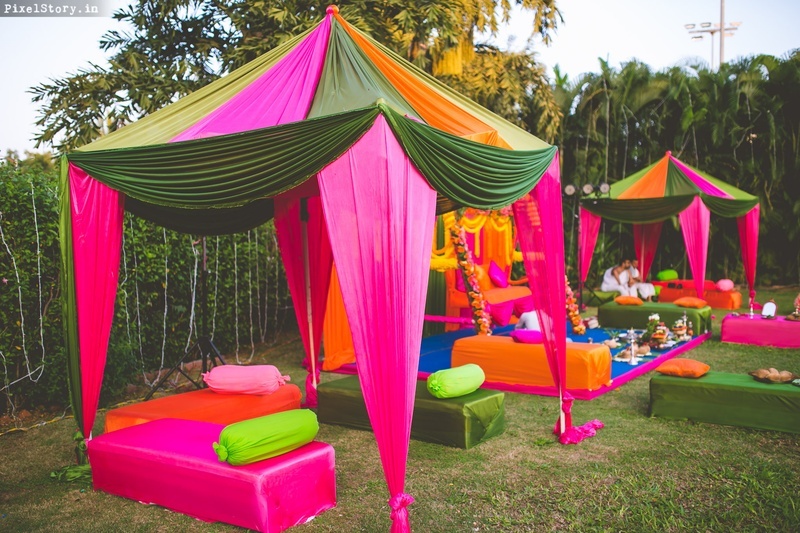 A vibrant, loud, colourful set up outside with fairylights wrapped on to globes, drapes in hues of fuchsia, orange and yellow set against the green grass created a beautiful contrast for their day-time ceremony. 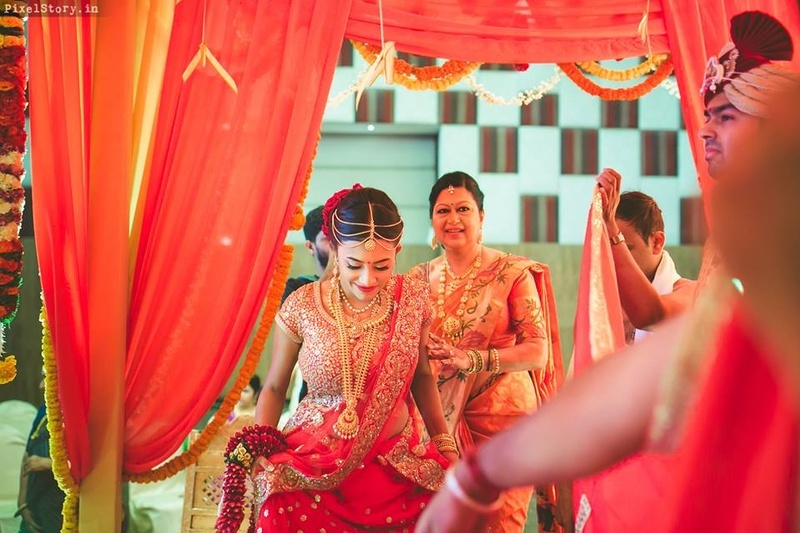 The mehndi followed and we saw this stunning bride in a fresh gold and white Anita Dongre creation. 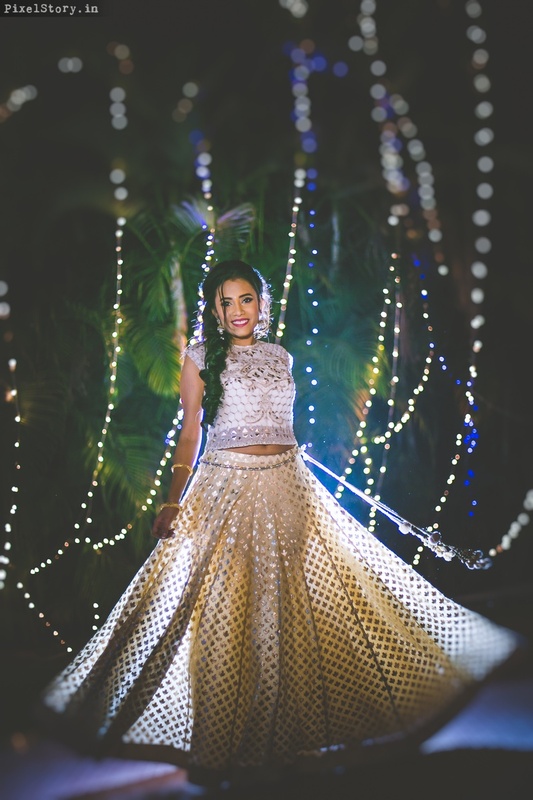 While this outfit was kept minimal and classy - her sangeet and cocktail outfit saw her in a more contemporary style. 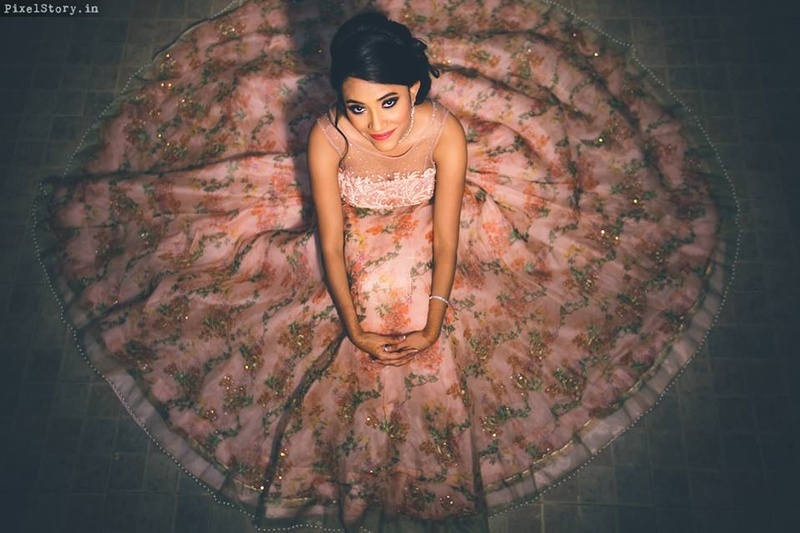 A floral designer gown by Archana Rao Label. 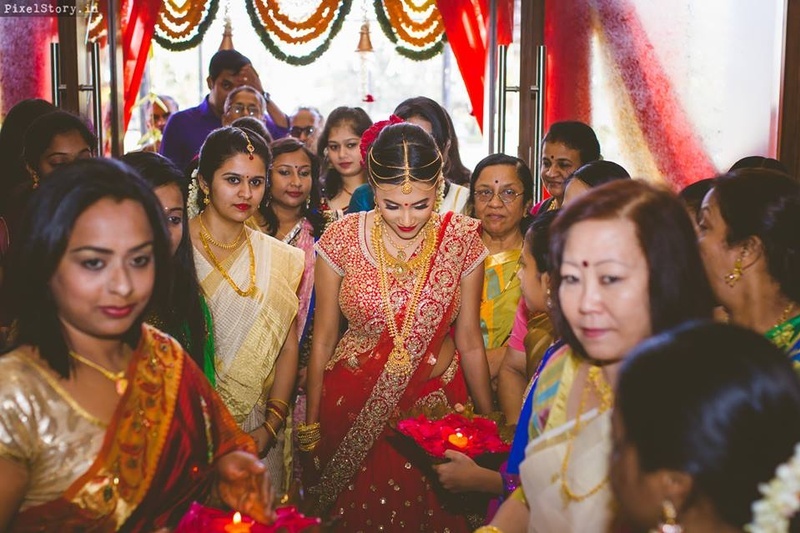 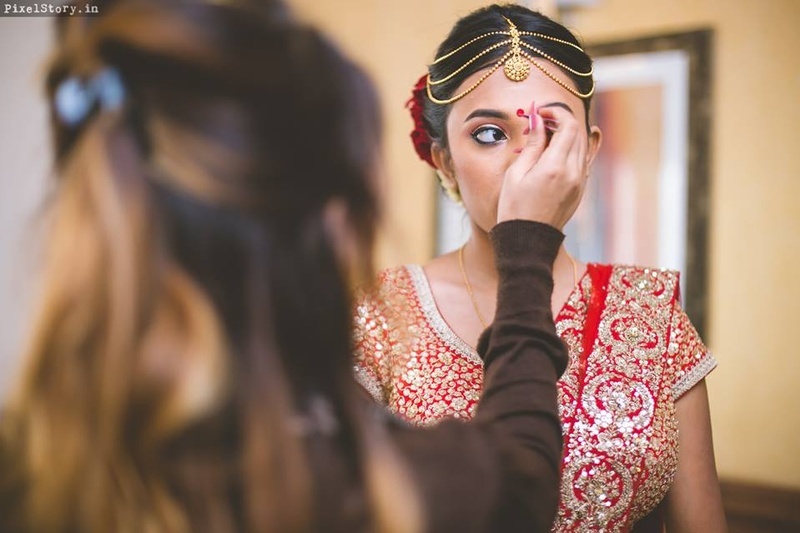 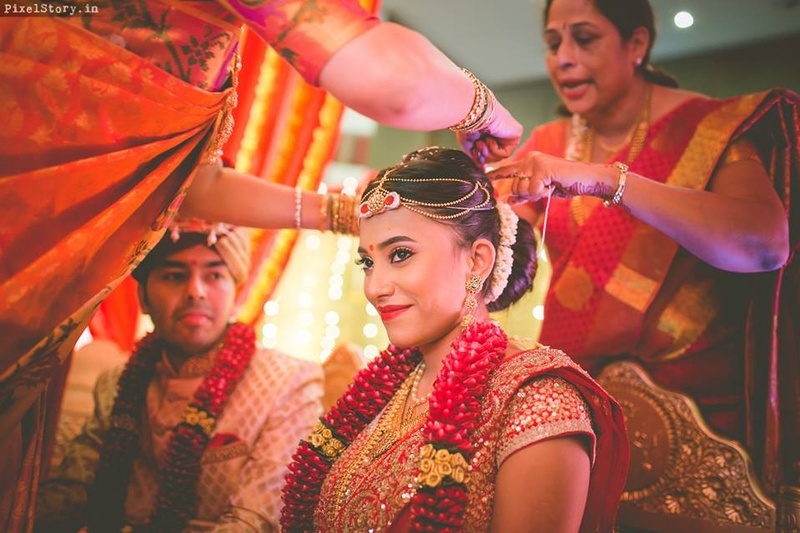 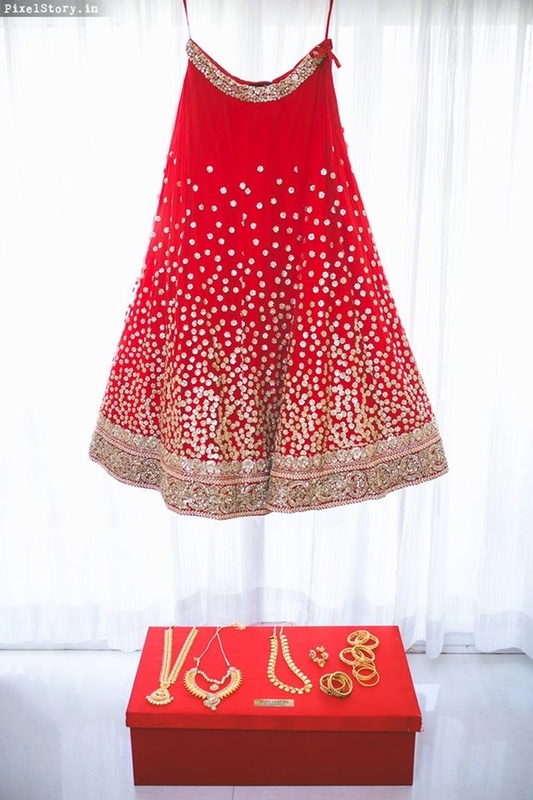 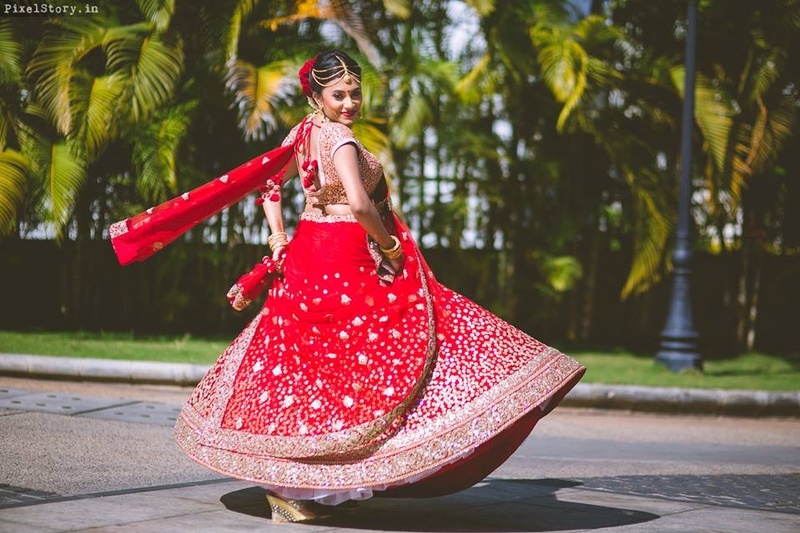 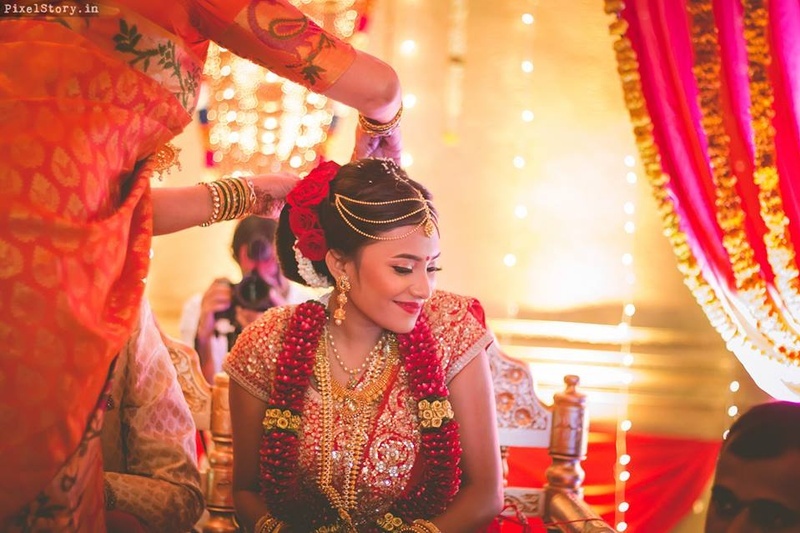 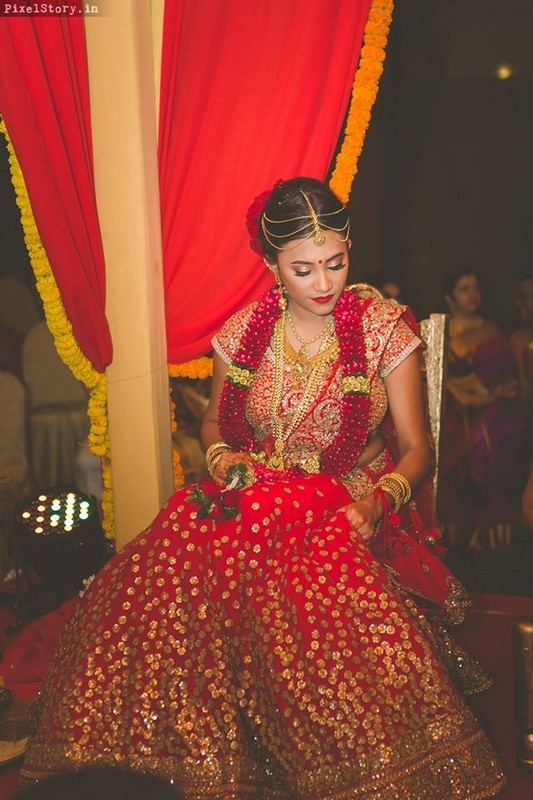 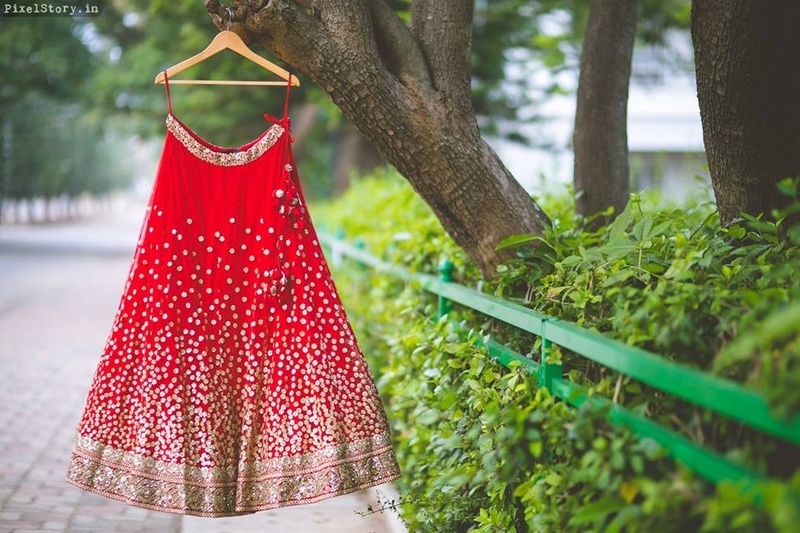 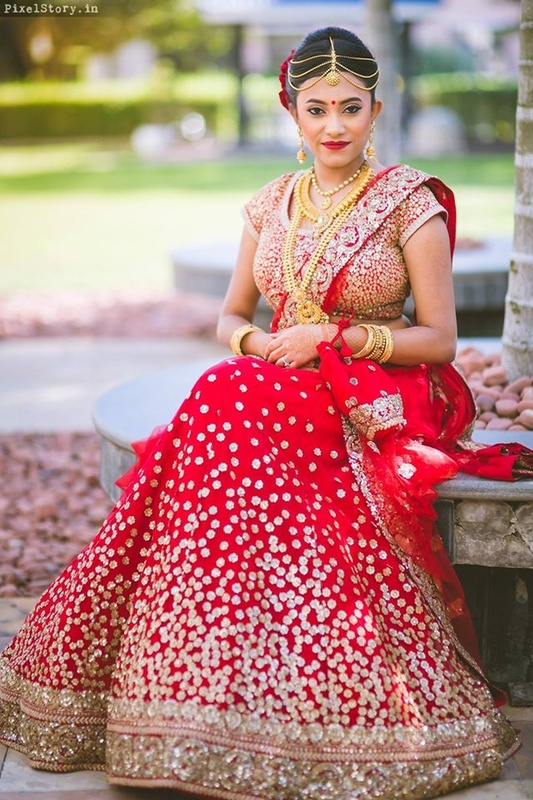 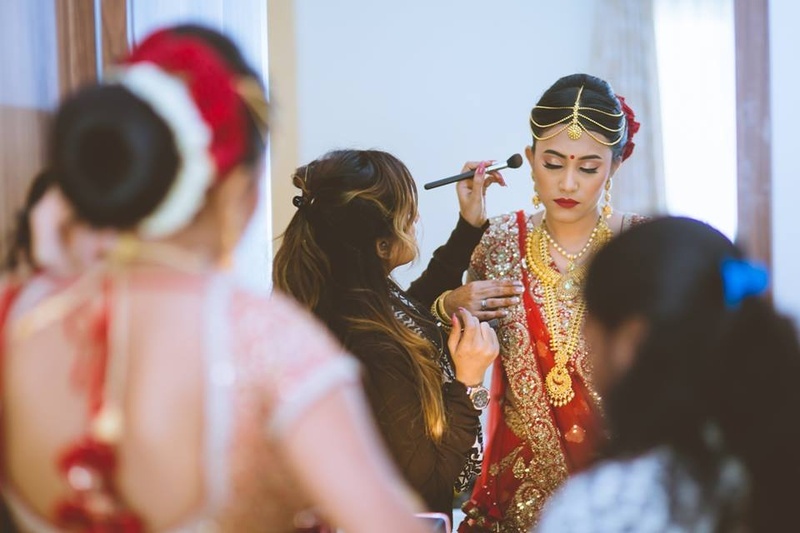 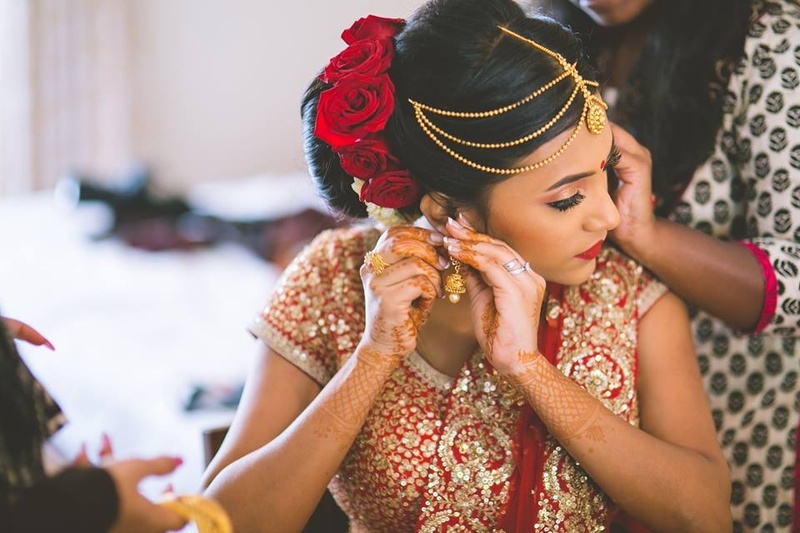 What's an Indian bride without red and gold drenched all over her? 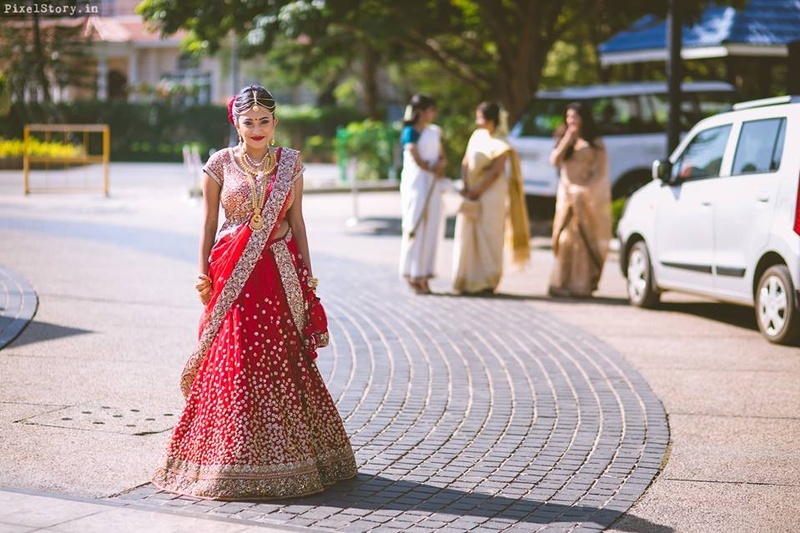 Dressed in India's bridal wear guru Sabyasachi - Chandini picked a bridal lehenga that was tradtional yet modern. 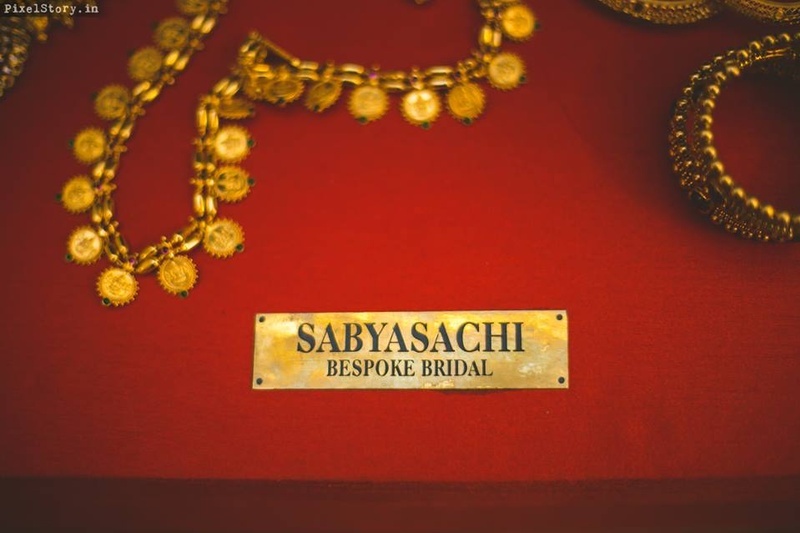 The scatter of gold sequins on traditional tones of red and gold showed off the sheer genius that Sabyasachi is! 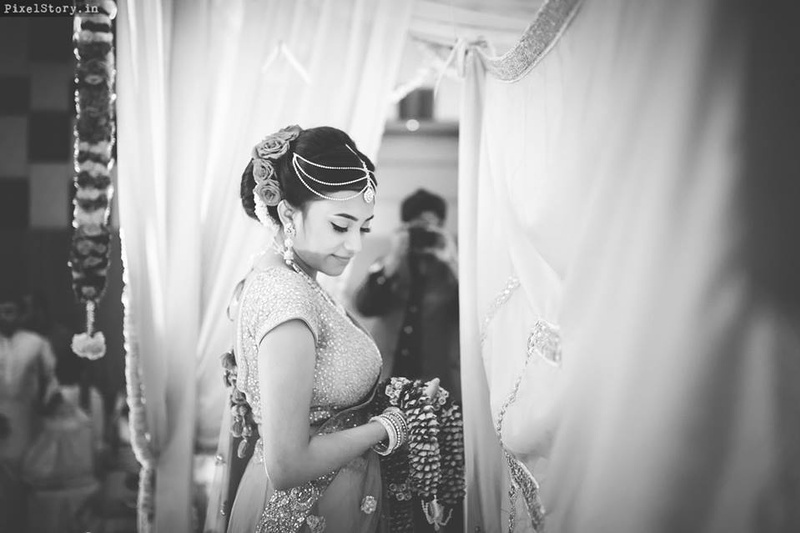 And this stunner of a bride pulled it off perfectly. 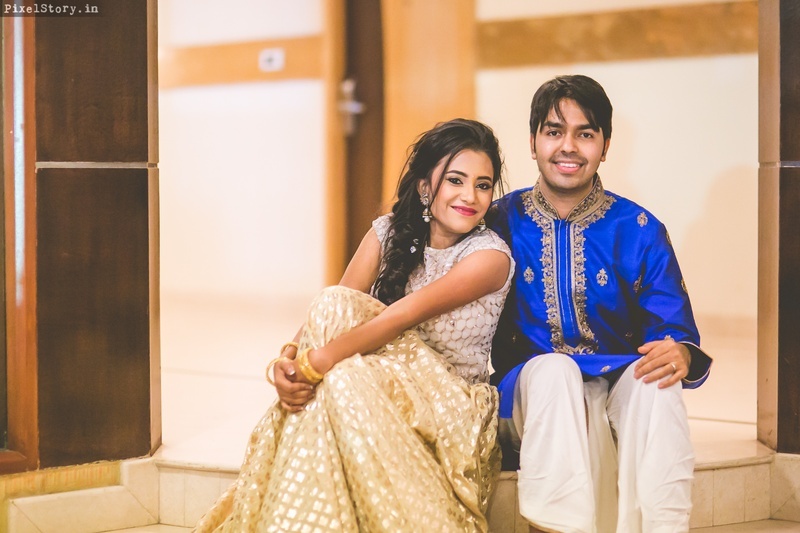 Akshay matched her perfectly in his gold textured sherwani and chudidaar bought from Samyak, Bangalore - proving yet again that it's never a bad idea to have coordinated wedding outfits! 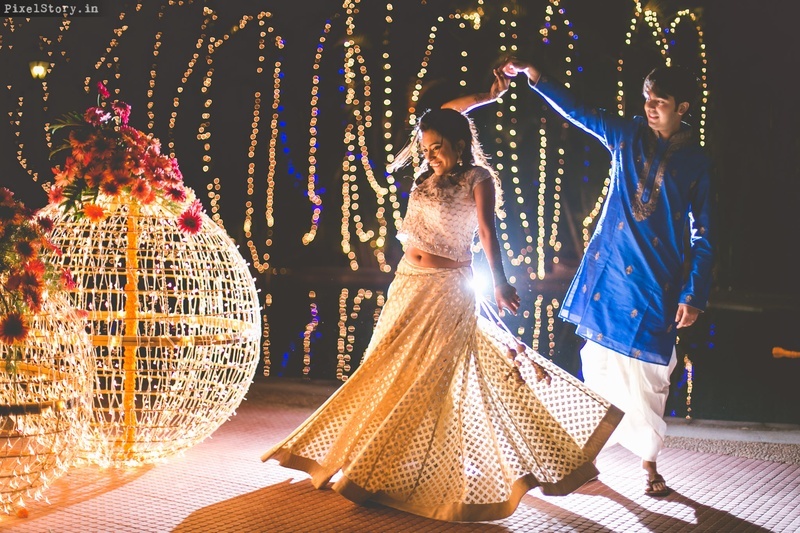 What you should look out for as you scroll through the wedding - the fairy light decor ideas, Chandini's multistrand maathapatti and the vibrant Malyali pre-wedding ceremony! 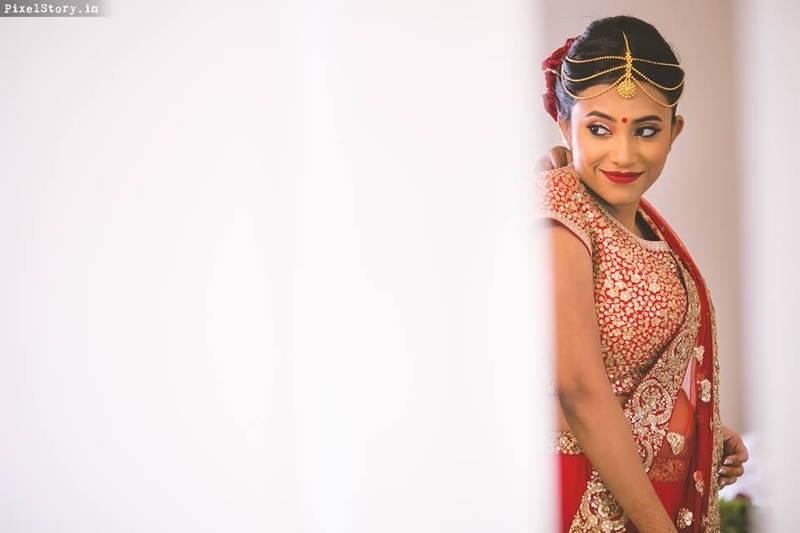 Chandini + Akshay Wedding Teaser (PixelStory.In) from PixelStory.in on Vimeo. 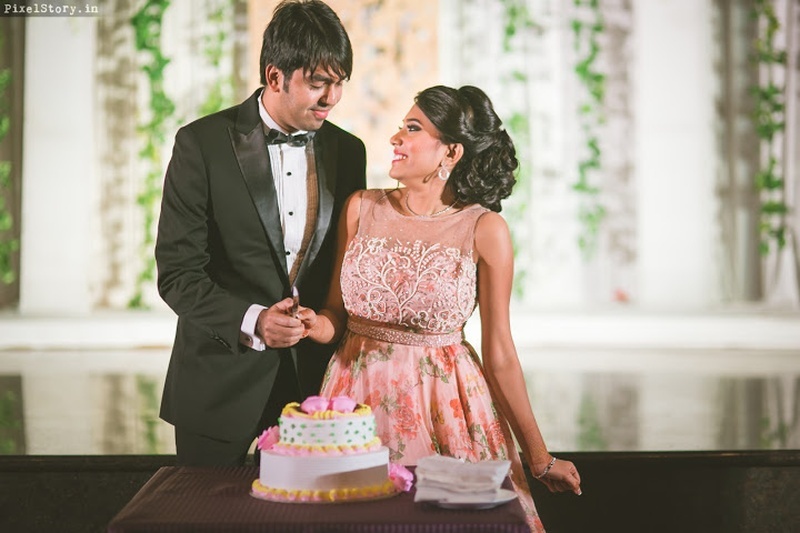 Bride and groom cutting their wedding cake on their cocktail party. 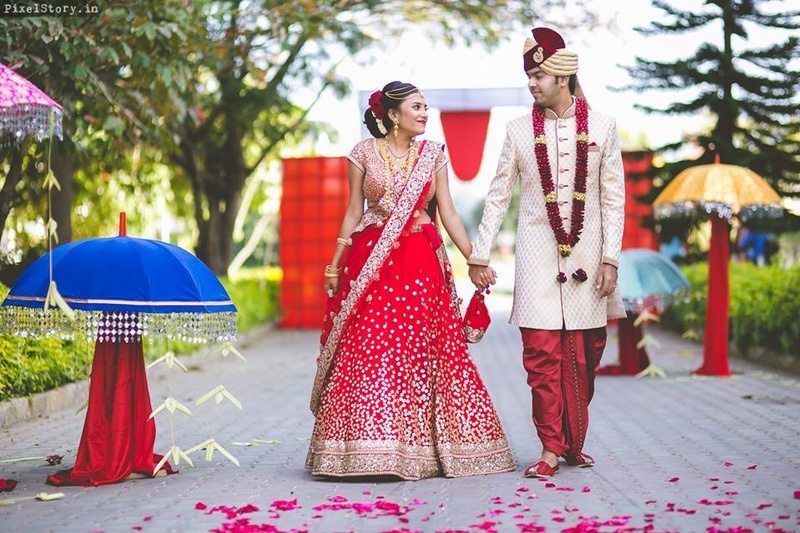 Bride looking gorgeous in this floral gown by Archana Rao Label. 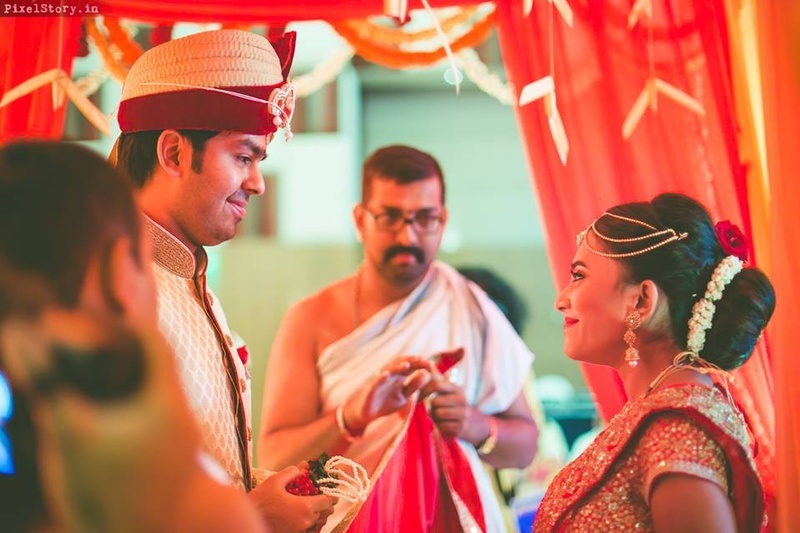 Cute moments of a groom. 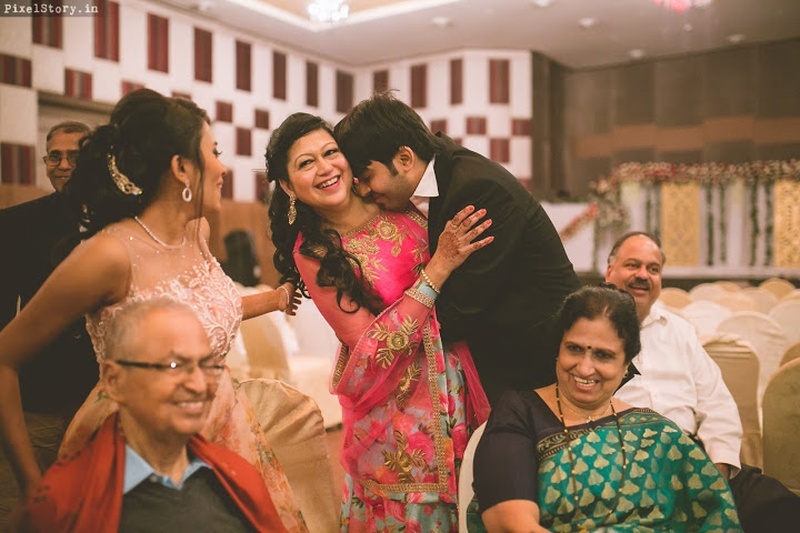 Hugging his mother with love. 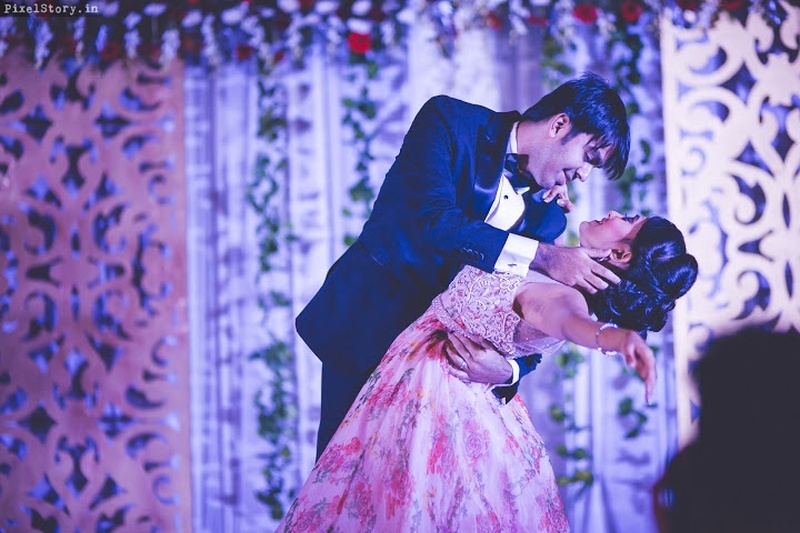 Perfect couple dance performance by bride and groom on their cocktail and sangeet party held at Clarks Exotica Resort and Spa. 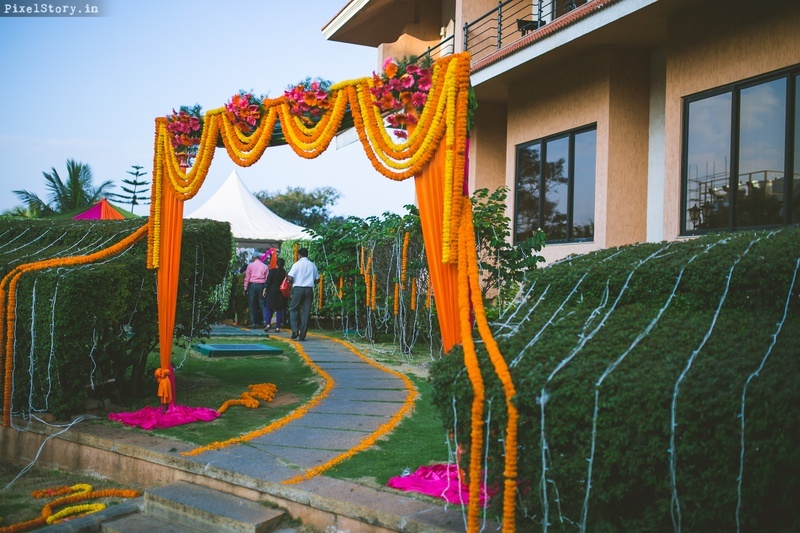 Floral entrance decor for mehendi ceremony. 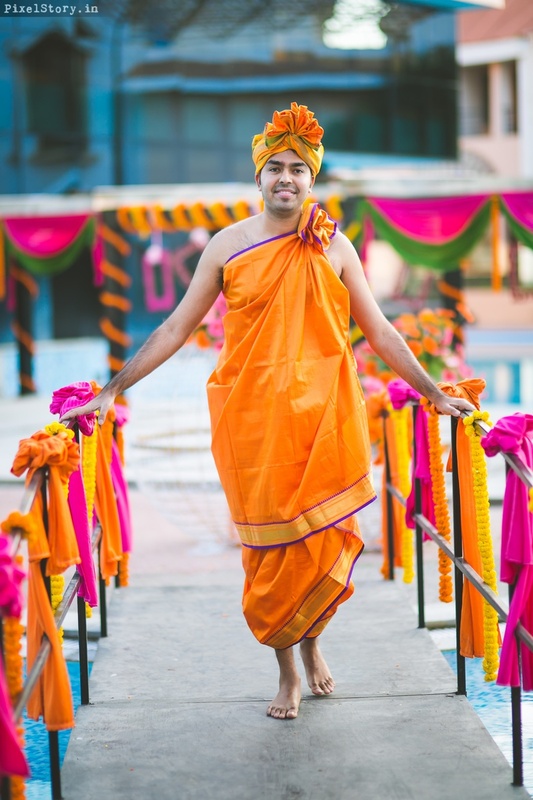 Groom wearing traditional outfit and all set for pre wedding ceremonies held at clarks exotica resort and spa. 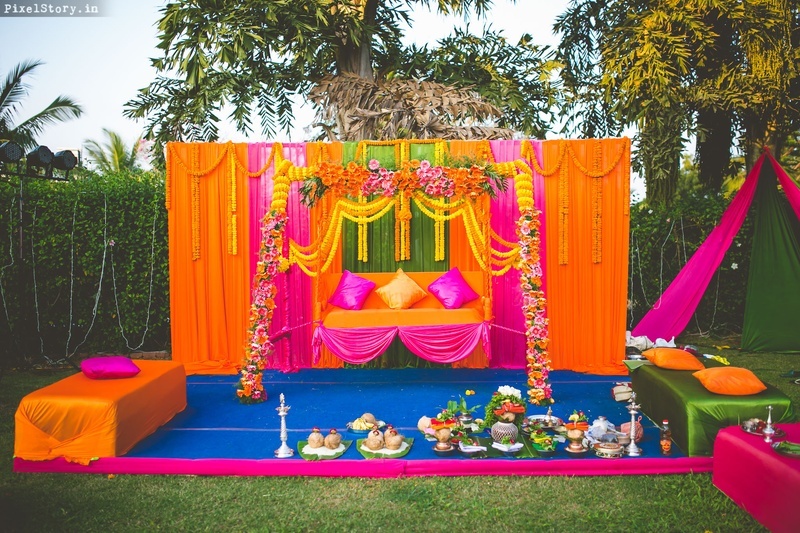 Beautiful colorful stage decoration for pre wedding rituals held at clarks exotica resort and spa. 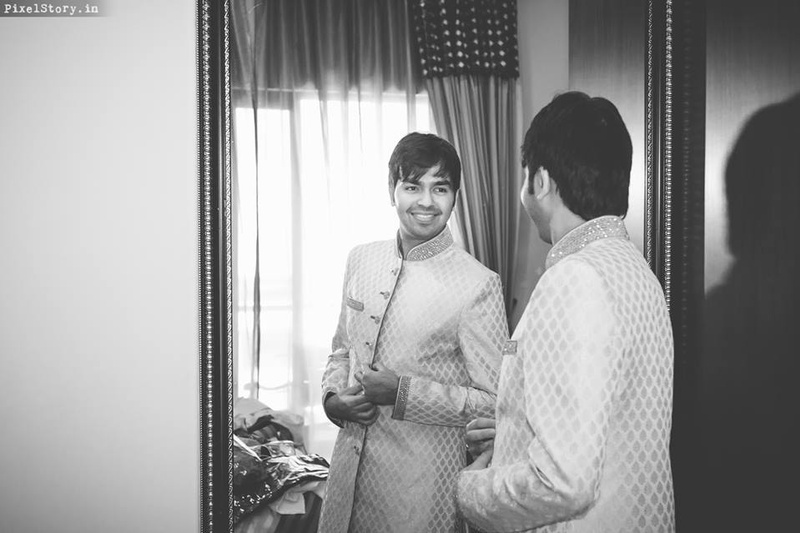 Groom walking down the aisle for the mehendi ceremony. 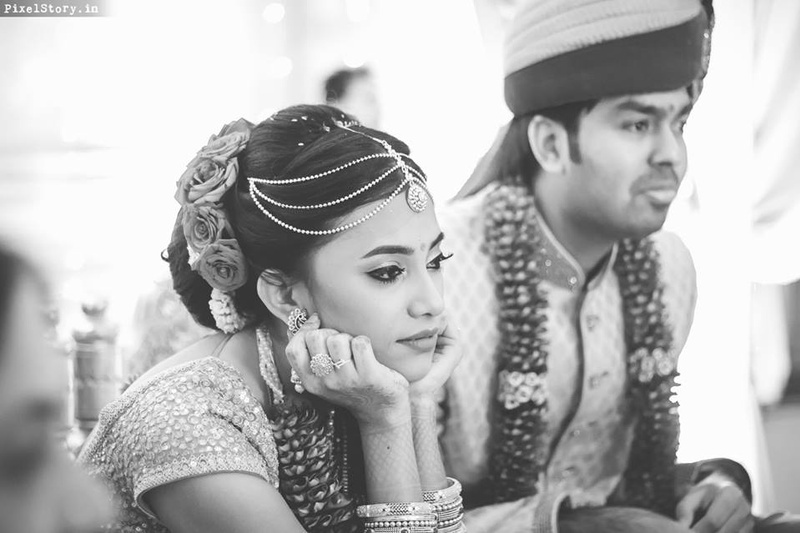 Bride and groom candid couple photography. 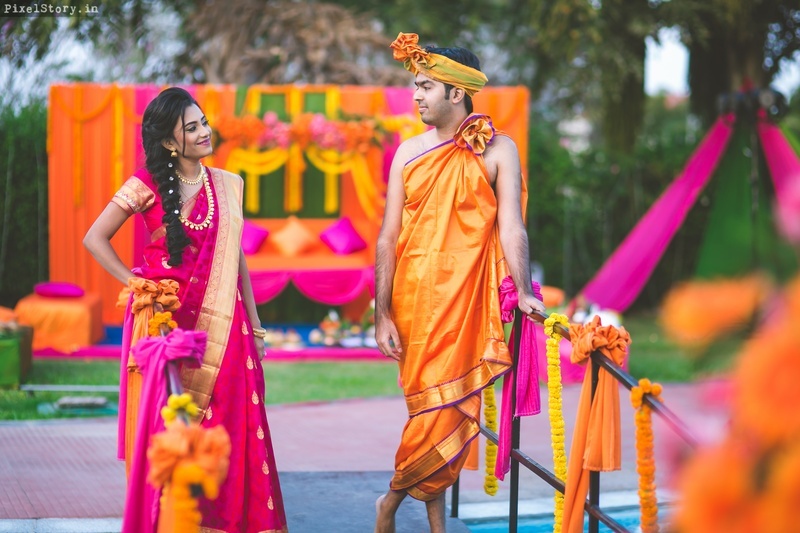 Bride and Groom all dressed for their mehendi ceremony. 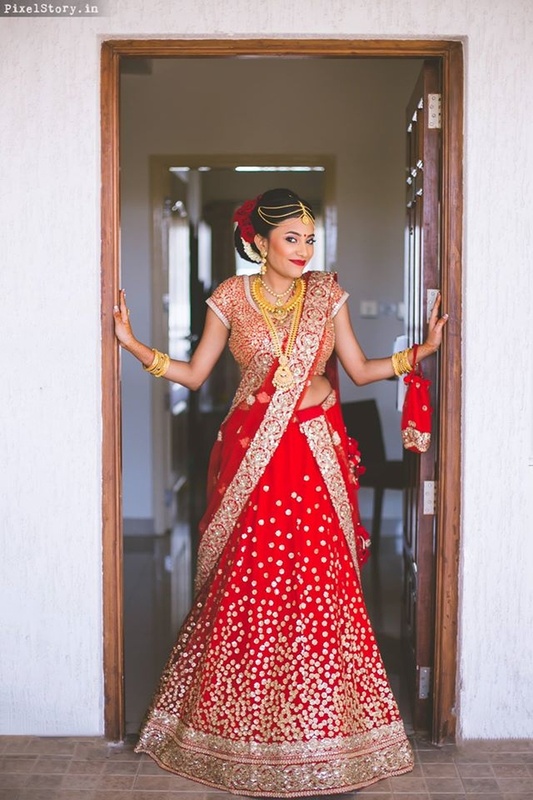 And they danced happily ever after..
Red and golden bridal lehenga by sabyasachi. 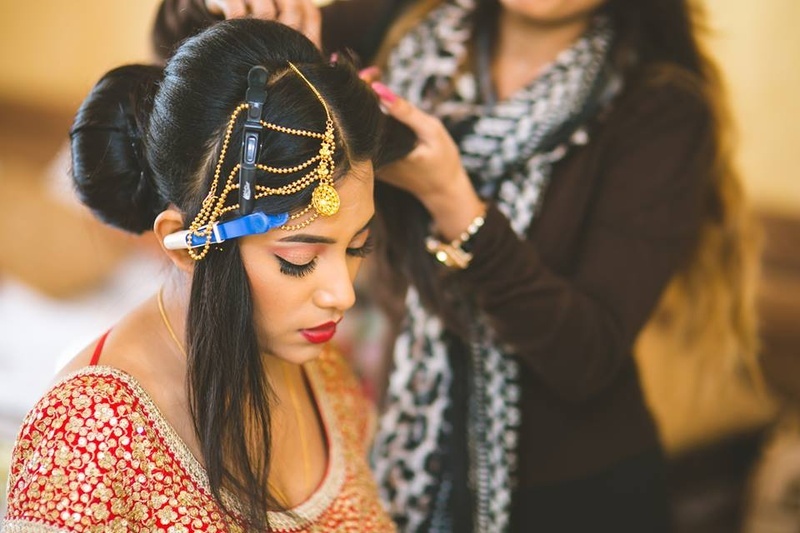 Cutest bride chandni getting ready for her wedding day. 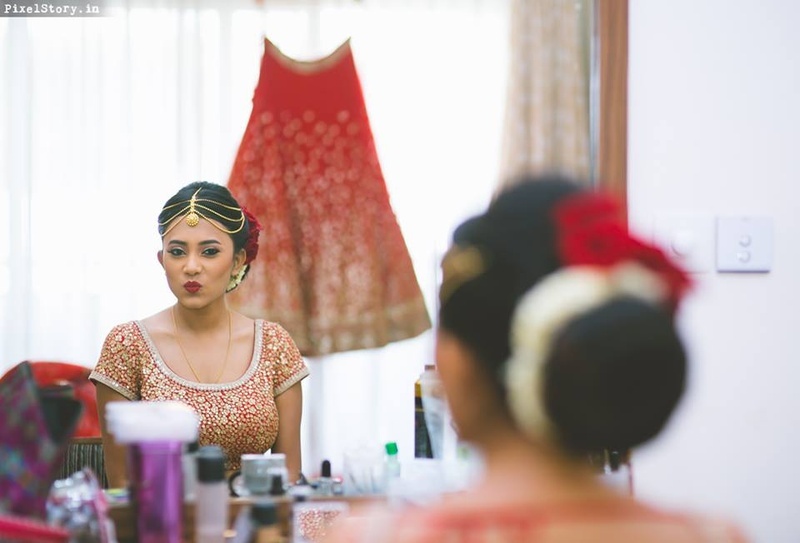 Bride getting ready for her wedding day. 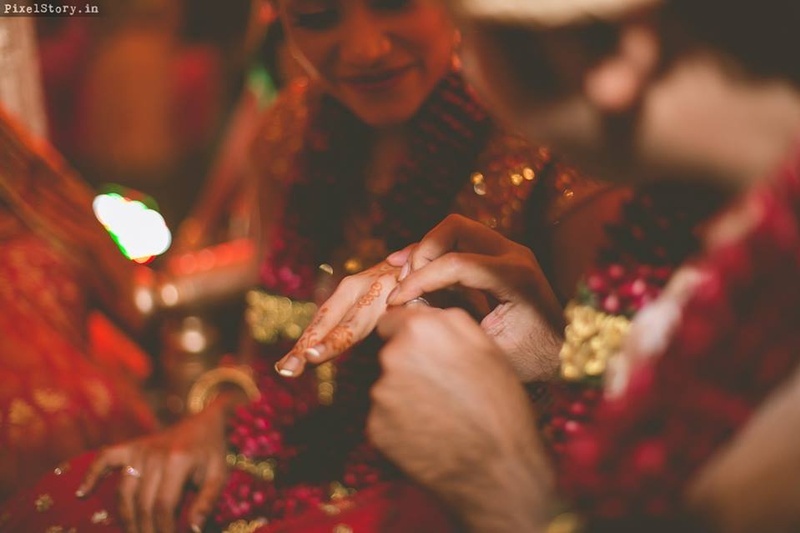 Rule it with 'ring'. 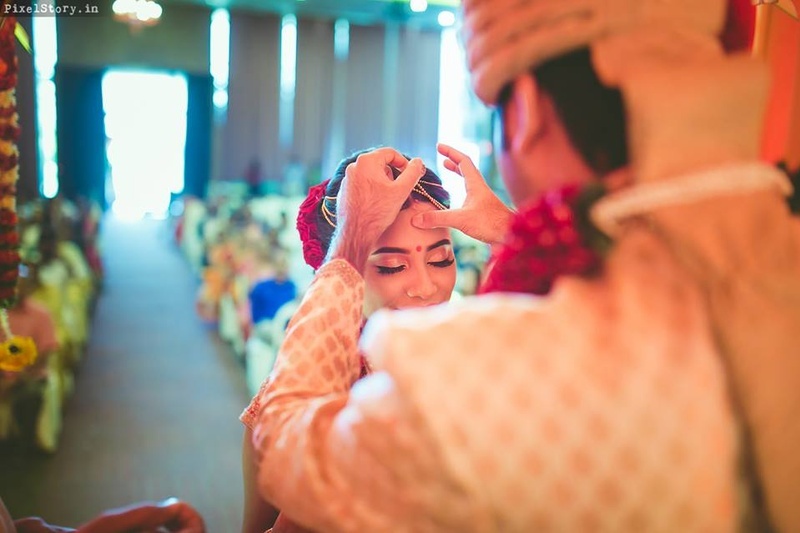 Cute post wedding traditions. 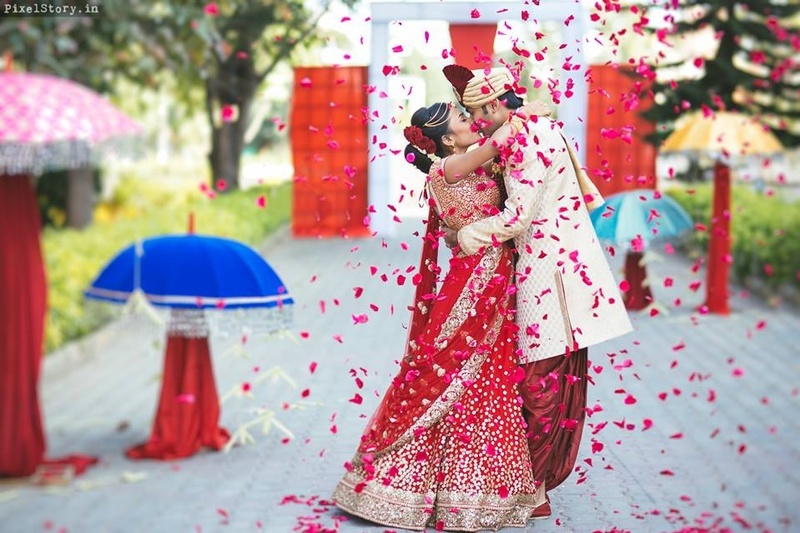 Some love stories create magic ..